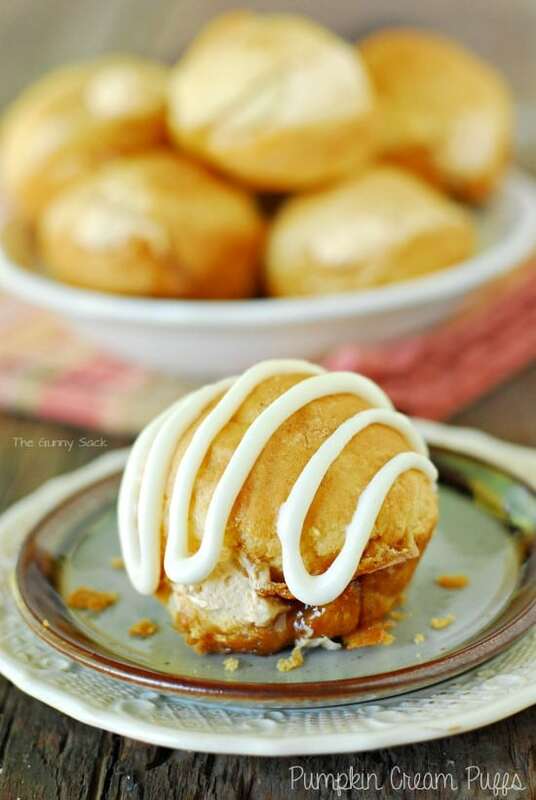 These Pumpkin Cream Puffs are another one of the pumpkin desserts to make this fall. 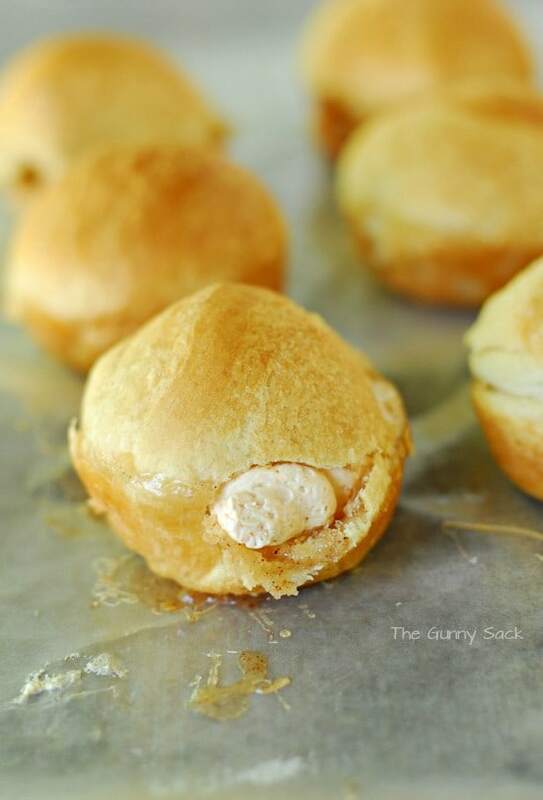 Cream puffs are easy to make with Pillsbury crescent rolls! Woke up this morning and it is 54 degrees! Yesterday on my morning walk, I discovered that some of the leaves have started changing color. Yes, my friends, fall is in the air and that means I am thinking about apple orchards, walks in the woods and pumpkin desserts. I’ve always loved autumn. Maybe it is because my birthday is in October? After the hot summer weather, I am ready to put on a cozy sweater and sit outside enjoying a cup of coffee in the crisp fall air. So, today I am sharing Pumpkin Cream Puffs. The outside is a Pillsbury crescent roll and the inside is pumpkin whipped cream. When my daughter was taking FACS (which is what we used to call Home Ec) in school, she came home and told us about these marshmallow puffs they made in class. She wanted me to buy the ingredients so that she could make them for us. I later learned that they are Magic Marshmallow Crescent Puffs. 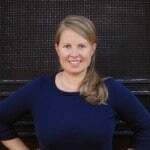 The recipe is from the Pillsbury Bake-Off in 1969 and was created by a fellow Minnesotan. I used her recipe as the base for these Pumpkin Cream Puffs. Mix together sugar and pumpkin pie spice. Dip a marshmallow in melted butter and then coat it with the sugar/spice mixture. 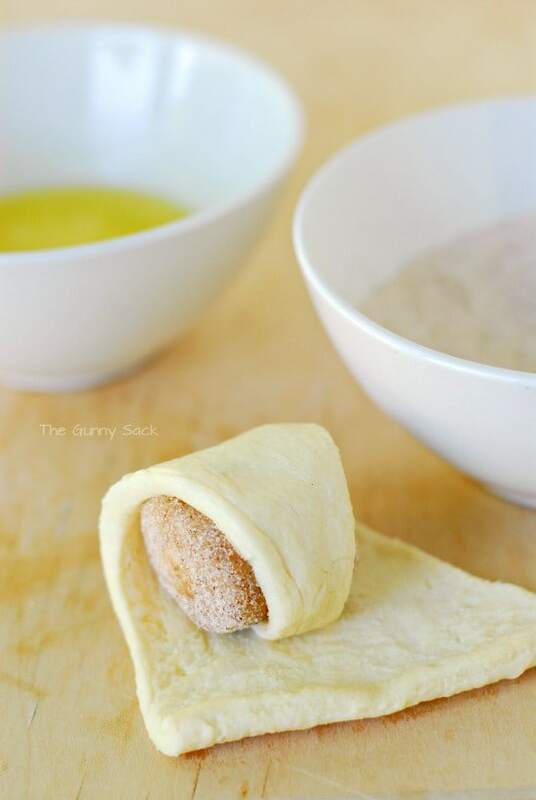 Roll a marshmallow in a crescent roll starting at the narrow tip of the triangle and then firmly pinch up the sides so that the marshmallow is completely covered with dough. Dip the bottom in melted butter and place, butter side down, in a greased muffin pan. Place the muffin pan in a jelly roll pan to guard against spills. Bake at 375 degrees for 12-15 minutes or until golden brown. The marshmallows will puff up and melt, coating the insides of the crescent puff with a delicious caramel like coating. To make the filling, beat cream cheese until light and fluffy. Add confectioners’ sugar, pumpkin and pumpkin pie spice. Then, fold in whipped cream. 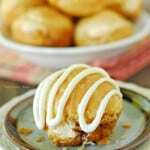 Use the pumpkin cream to fill cream puffs. Some of the marshmallow crescent puffs will have broken open while cooking so you can fill from that hole. If not, poke a hole in puffs to fill them. 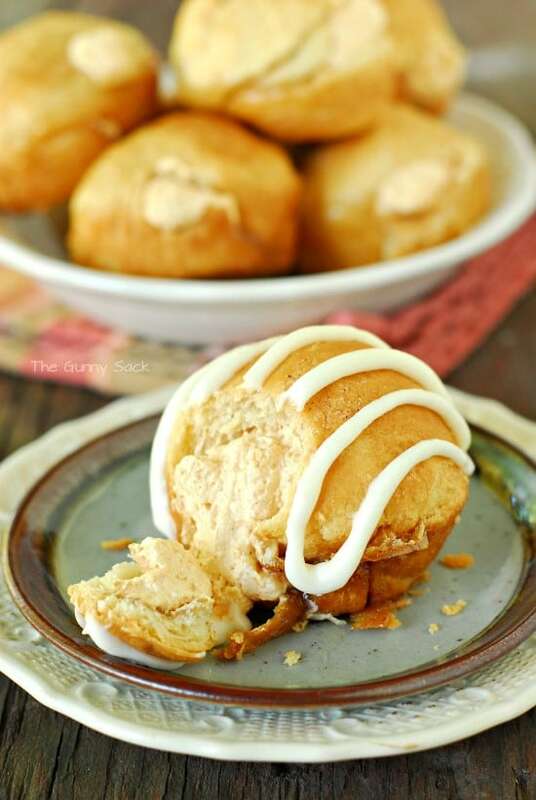 Drizzle the pumpkin cream puffs with cream cheese icing and keep refrigerated until ready to serve. Mix together flour, sugar and pumpkin pie spice. Dip a marshmallow in melted butter and then coat it with the sugar/spice mixture. Roll the marshmallow in a crescent roll starting at the narrow tip of the triangle and then firmly pinch up the sides so that the marshmallow is completely covered with dough. Dip the bottom in the melted butter and place, butter side down, in a greased muffin pan. 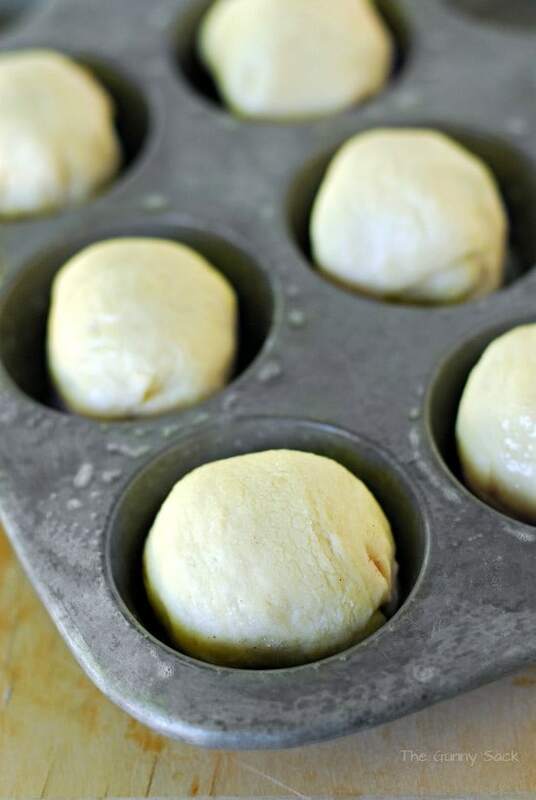 Place the muffin pan in a jelly roll pan to guard against spills while baking. Bake at 375 degrees for 12-15 minutes or until golden brown. Add confectioners’ sugar, pumpkin and pumpkin pie spice. Use the pumpkin cream to fill cream puffs. I made these tonight and they tasted divine! However, they did not look pretty at all or work very functionally well. Any tips? It seemed like the bottom of the pastries got saturated by the butter and sugar and ended up less without the hard, outer pastry surface and rather sticky and gooey. Perhaps to much of a butter dunk on the bottom? Longer time in the oven? It was also quite difficult to get them out of the muffin tins; I may try just on a baking sheet next time, so I can use a spatula. Oh dear! At least they tasted good, right? 😉 I think the issue is that the marshmallow leaked out of the dough while baking. Firmly pinch the dough seams and make sure that it isn’t stretched too thin. I don’t think that it would be the butter because people use crescent roll dough to make monkey bread and they pour melted butter/sugar over the top of it and it still bakes. Make sure that your muffin tin is well greased and if the tops aren’t baked, go ahead and bake longer since oven temps vary. Best of luck! Oh my Tonia. I’m loving the sound of these! As a pumpkin obsessed blogger, I need these in my life! These sound awesome! I am going to make them for my friends at work!! So easy and quick to make. My husband absolutely loved them!!! He wants me to make them for Thanksgiving. Thank you for the recipe! These puffs sound delicious!! 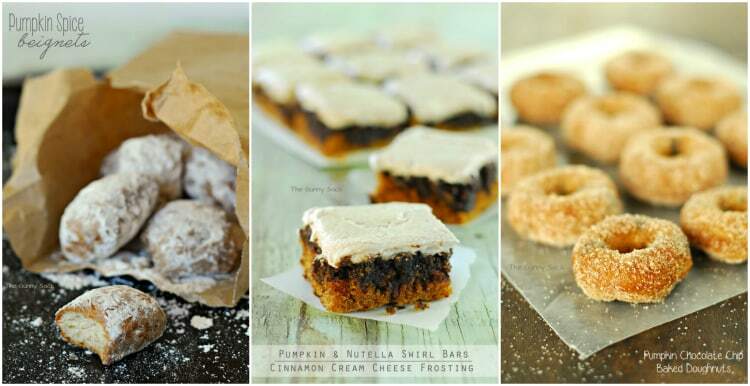 I’m so excited that fall is finally here and I will be making these soon! 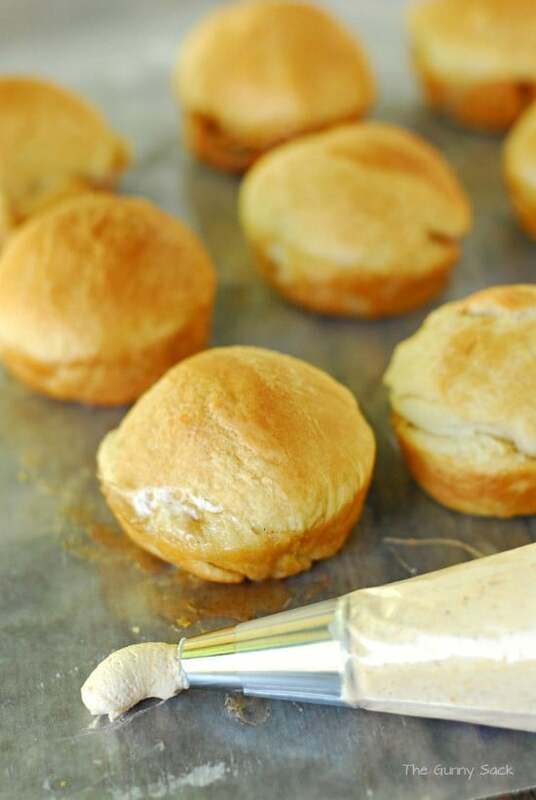 Such a simple way to make cream puffs; love it! My grandma always made the best cream horns at Christmas time! Great idea! These look so good, and your pictures are amazing as always! 🙂 Thanks for sharing! Tonia, these puffs look AMAZING!!!! My boys would love these! This looks so good. I don’t like marshmellows except burnt over a campfire, but these look so good, I am going to try them. Thanks for the recipe. Ion -La La! !!!!!!! GOOD!!!!!!! These may just be the best cream puffs YET! I am so excited for cooler weather! Can’t wait to be able to spend more time in the kitchen making pumpkin desserts like these cream puffs! Is it weird I’m pumped for hoodies and jeans? I LOVE this time of year in Minnesota! Plus I get to drool over yummy treats like this! Amazing! I’ll have to try these this fall!! they sound incredible! I’m an autumn gal myself, so I love anything pumpkin! But these are taking it to the next level, love them! OH holy yum!!! I love pumpkin everything and am so excited for cooler weather to be here!!! I grew up making the marshmallow treats with biscuit dough and all covered in more butter and cinnamon sugar. We called them marshmallow pillows and they were a favorite. I love the idea of filling them like cream puffs. So smart! Gorgeous photographs! The pumpkin and cream combination sounds delicious. Thanks for sharing! Thanks Whitney! I’m delighted you stopped by! Thank you for sharing this recipe with us Tonia, You have got to be the best Baker in your State. And you, Anna, have to be my biggest fan! Thank you for always leaving me such kind comments! These look so yummy! Here in Seattle we are having 90 degree weather, which is so crazy for us. I can’t wait for cozy sweaters and hot drinks to enjoy. Thanks for this recipe, my family would love them!! Oh, that is crazy for Seattle! We’ve had hot weather this past week but things finally cooled off. Thanks for stopping by Patricia!